Will you just look at the size of that thing? Craziness! And one of the things I love about my new neighborhood. I was taking out the garbage this weekend & my new neighbor, an old school Italian retiree, introduced himself. 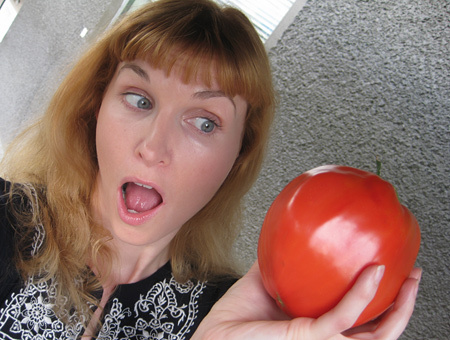 We had a little chat about our respective yards & I walked back into my house with 3 giant tomatoes fresh from his garden. Such a sweetheart! And the tomatoes? So freaking good. I’ve been eating my own bastardized version of insalata caprese until I’m slightly sick to my stomach from too much balsamic vinegar. I slice up bocconcini cheese, tomatoes, fresh basil & then drizzle olive oil & balsamic vinegar over top, then sprinkle liberally with salt, pepper, maybe a bit of oregano. One of those Italian seasoning spice jars is perfect. Oh & also – yum. 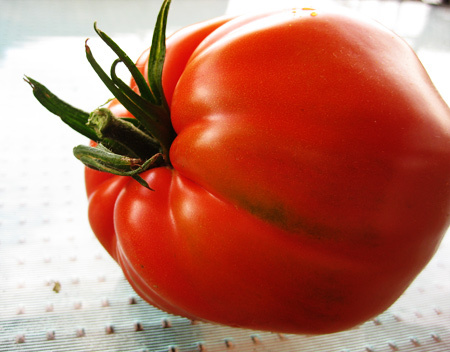 WOW that is such a juicy yummie tomatoe!! Have a lovely merry happy day and love to you!